Triple Crown Products now offers blazing 5-Day turnaround times on a variety of your favorite custom items! Our 5-Day program gives you the fastest turnaround times on a selection of custom items including our best-selling Polo, T-shirt, Sweatshirt, Hi-Viz Safety Vest and Richardson Baseball Hat. If your logo is already set up with Triple Crown Products, your order can ship in as few as 5 days, while new orders ship just 5 days after your final art approval. DON’T WAIT! Get your order started today using our 5-Day Turnaround Program with absolutely no upcharge on your order! 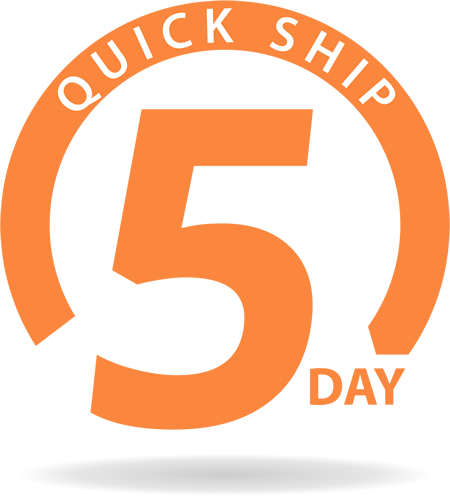 – 5-Day Ship Program is subject to product availability. – Re-orders ship in 5 days. – New orders ship in 5 days after final art approval. – All other in-stock items generally ship in 5-7 days after final art approval. – Available with Screen Print and Embroidered Logos. – Up to 2 logo locations, 1 decoration method per order. One Size Fits All - in 80 Colors.